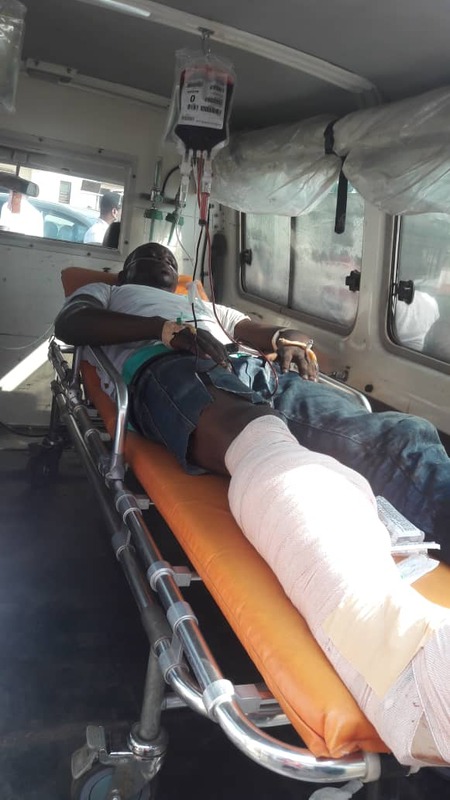 Doctors at the 37 Military Hospital may have to amputate the leg of one of the victims of the recently held Ayawaso West Wuogon by-election violence. According to the doctors, amputation of the badly damaged leg could be the only way to keep him alive after the serious injury sustained. The victim, Ishalu Yaro, 37/years and other victims numbering about five were shot at close range by masked men believed to be operatives from the national security who had stormed the residence of the NDC candidate for the by election on suspicion of him keeping guns. Yaro, injured right leg has been wrapped in a huge white bandage with a shiny metal fixed along the leg to keep it straight and supported with pillows because of the close-range shot scattered the bones in his legs leaving writhing in acute pain. But doctors have said he would have to be amputated to sustain his life. The victim is a footballer and has undergone two separate surgeries to help him recover. He is expected to undergo the third one. Meanwhile, a three-member committee has been set up to investigate the matter. The committee is chaired by former CHRAJ Boss, Justice Emile Short.